Tuesday night was the final evening of Tuesday night club league racing for the optimist class and conditions were ideal for all main fleet sailors (gold, silver and bronze fleets}. A total of fourteen sailors made it to the start line, while the up and coming young rock stars that make up our copper fleet had to sit it out due to the blustery conditions on the bank. However, over the last number of weeks these ‘copper’ sailors had some great racing and showed clear evidence of improvement with each outing. 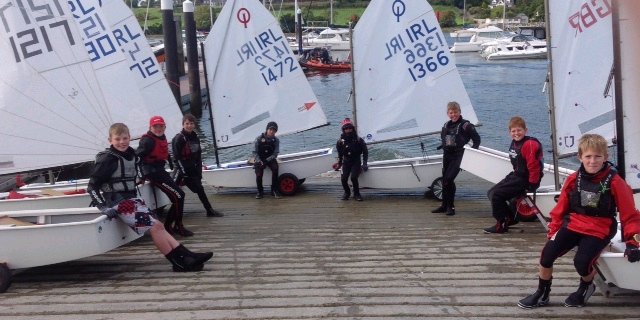 Special thanks to Jason Burns for making a great effort and ensuring that these (our youngest and future main fleet sailors), took to the water. Thank you also to Robert Foster who acted as race officer over much of the July and August mid week league racing. As many of our sailors head back to school this week, they say they are looking forward to the 2016 Tuesday league racing already.